Are you a beginner? Find out more about what Multi Grids are here. Multi grids are stainless steel A5 plates with a different design on each grid. Pergamano multi grids are stainless steel. 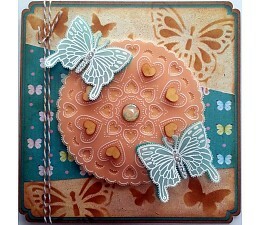 Multi grid 46 coordinates perfectly with the Aurelie bird masking stencils. Pergamano multi grids are stainless steel. Made in Holland is the new themed grid for 2016, featuring some charming images: a bicycle, a pair of clogs, a windmill, sailing boat, a cow, cheese and more. 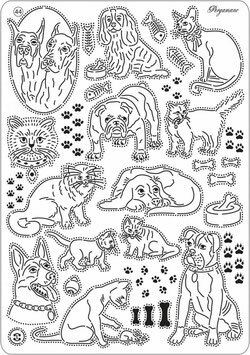 A large variety of cats and dogs plus bones paw prints, fish bones to emboss and perforate on parchment paper. The parchment sampler is by Maggie Byford. Multi grid 43 fits perfectly with the paper collections This Is The Season. With this grid you can easily create the most beautiful Autumn, Winter and Christmas cards. Multi grid 43 is worked on with the perforating tool 1-needle (10241) and embossing tool extra small ball stainless steel (10072). Mix & Match the Pergamano This is the Season with the Aurelie This Is The Season collection! The parchment sampler is by Maggie Byford. Multi grid 42 fits perfectly with the paper collections This Is The Season. With this grid you can easily create the most beautiful Autumn, Winter and Christmas cards. Multi grid 42 is worked on with the perforating tool 1-needle (10241) and embossing tool extra small ball stainless steel (10072). Mix & Match the Pergamano This is the Season with the Aurelie This Is The Season collection! 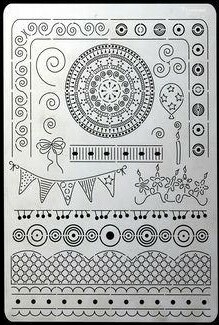 The parchment sampler is by Maggie Byford. Multi grids are stainless steel A5 plates, each grid with a different design. Multi grid 41 is the perfect grid to use with the paper collections Botanical garden. The parchment sampler is by Maggie Byford. 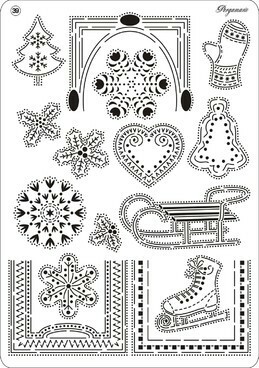 This beautiful new grid has many winter themes from ice skates and sledges to mittens and christmas trees. 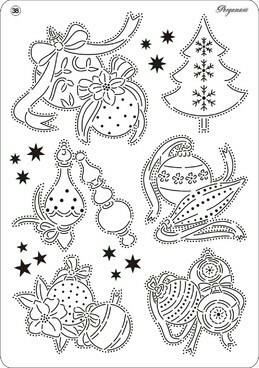 This beautiful new grid has seven festive elements plus stars. Another new Multi Grid from Pergamano. Multi grid 37 is the perfect grid to use with the paper collections Summer Garden (62596 and 62597). On multi grid 37 Summer Flowers you work with perforating tool 1-needle (10241) and embossing tool extra small ball stainless steel (10072). Multi grids are stainless steel A5 plates, each grid has a different design or theme. Multi grid 36 is the perfect grid to use with the parchment paper and design paper Summer Garden (62596 and 62597). 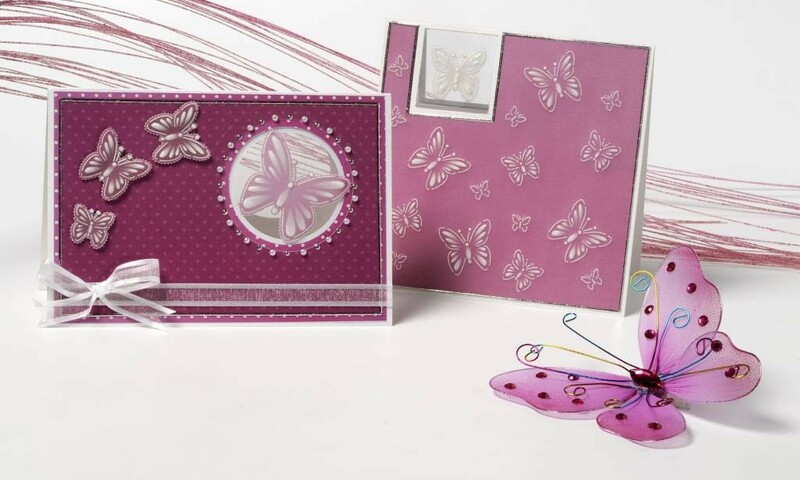 This grid allows youto easily create the most cheerful spring and summer cards. On multi grid 36 Summer Garden you work with perforating tool 1-needle (10241) and embossing tool extra small ball stainless steel (10072). 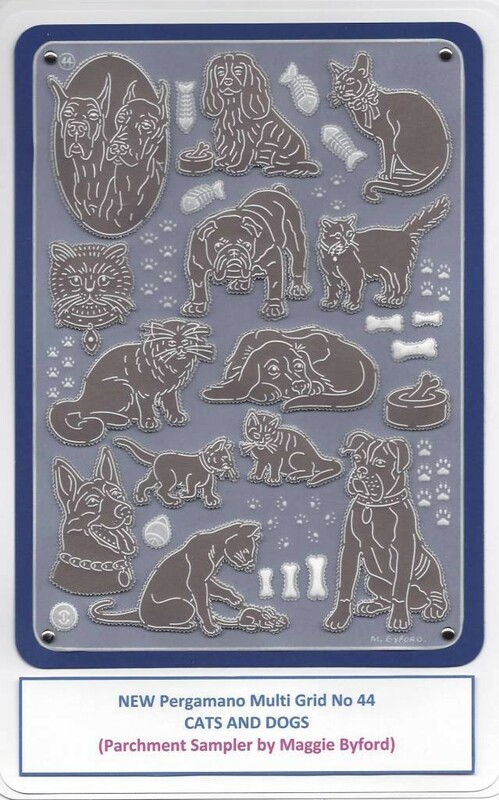 Multi grids are stainless steel A5-sized sheets with a different design on each grid. On multi grid 33 Butterfly kisses perforating tool 1-needle (10241) and embossing tool extra small ball stainless steel (10072) are used. 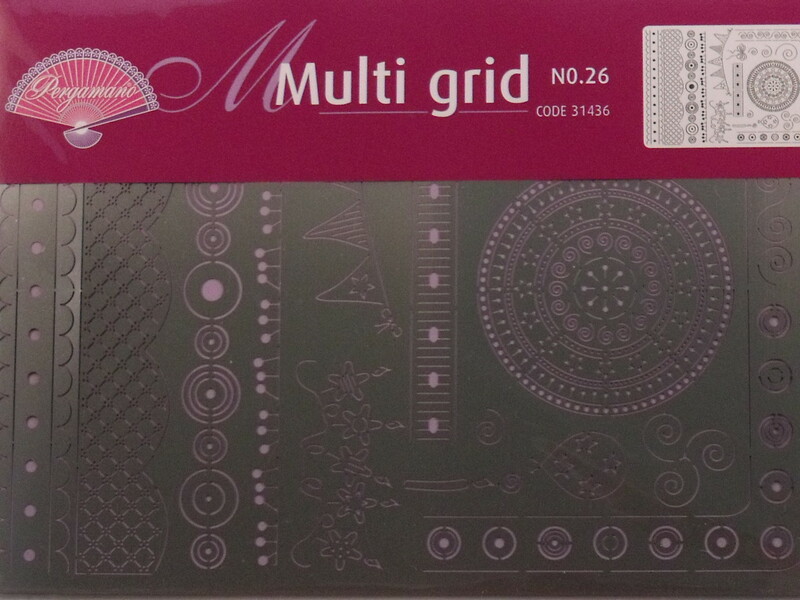 Multi grids are stainless steel A5-sized sheets with a different design on each grid. On multi grid 32 Swirls perforating tool 1-needle (10241) and embossing tool extra small ball stainless steel (10072) are used. 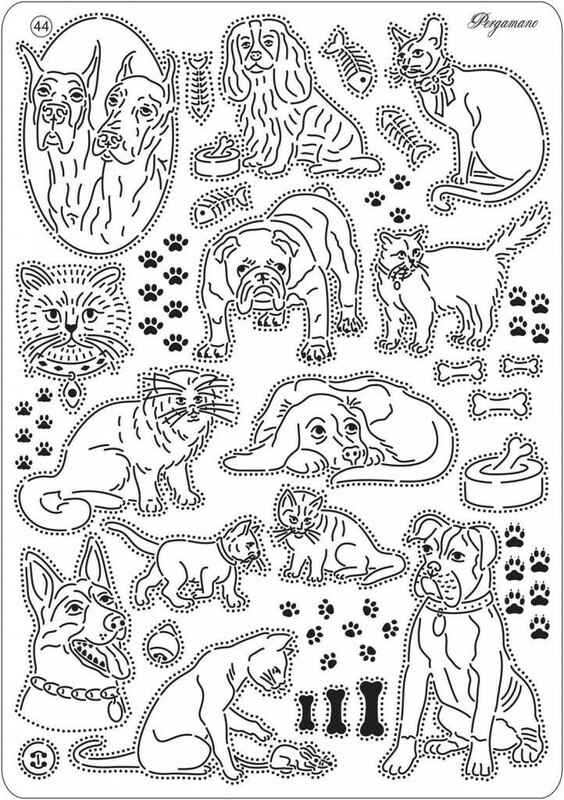 Multi grids are stainless steel A5-sized sheets with a different design on each grid. On multi grid 31 Butterflies 2 perforating tool 1-needle (10241) and embossing tool extra small ball stainless steel (10072) are used. 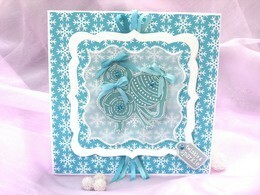 Have a look at the sampler provided by kind permission of Maggie Byford, for inspiration. 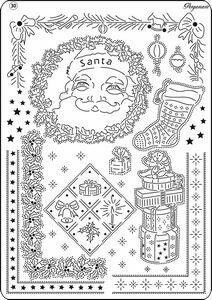 Multi Grid no 30 Victorian Christmas goes perfectly with the Pergamano Clear Stamps Santa Claus and gifts. Multi grid straight A4 (bold). Use single needle (Bold) with this grid. 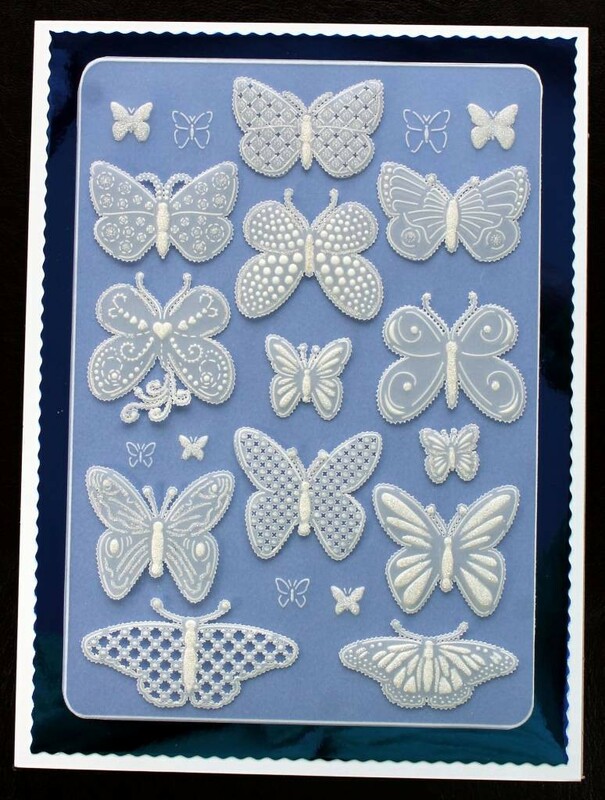 Make beautiful embossing and perforating work on parchment paper. The straight multi grid can be combined with multi grid 19 - diagonal. 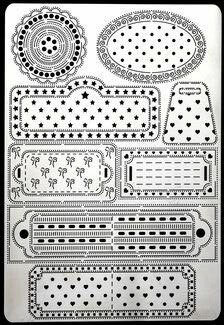 The combination will form regular patterns of perforations or small dots. Multi grid no 27 has plenty of designs for tags, simply create your own edges and lace work by using the perforating and / or embossing patterns on the multi grid. This grid can be used in combination with Pergamano perforating and embossing tools as they fit the grid exactly. 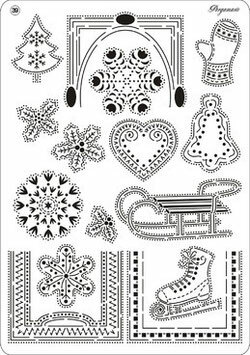 Multi grid no 26 has bunting, candles and balloons, simply create your own edges and lace work by using the perforating and / or embossing patterns on the multi grid. This grid can be used in combination with Pergamano perforating and embossing tools as they fit the grid exactly. 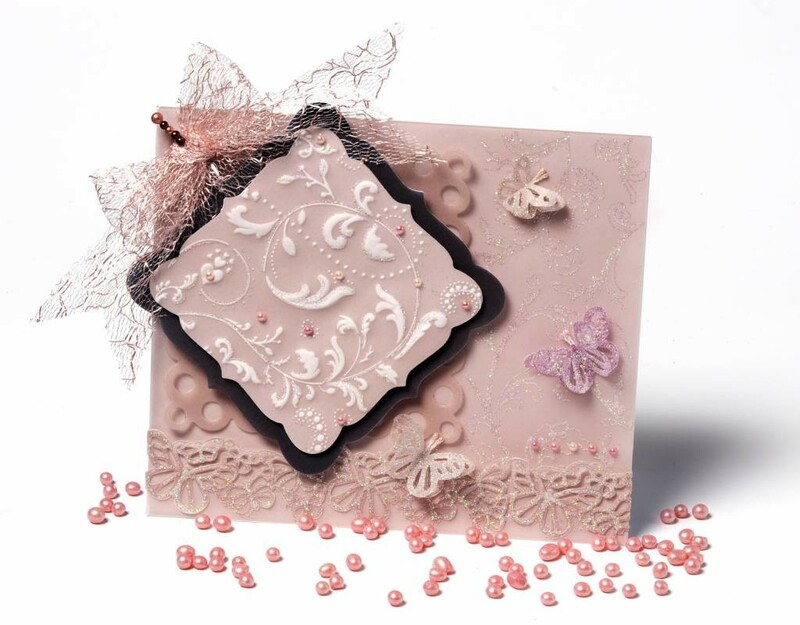 Multi grid no 25 has square and rectangular borders and individual motifs, simply create your own edges and lace work by using the perforating and / or embossing patterns on the multi grid. This grid can be used in combination with Pergamano perforating and embossing tools as they fit the grid exactly. 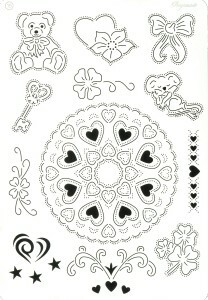 Multi grid no 24 a diagonal fine grid, simply create your own edges and lace work by using the diagonal grid. This grid can be used in combination with Pergamano perforating and embossing tools as they fit the grid exactly. 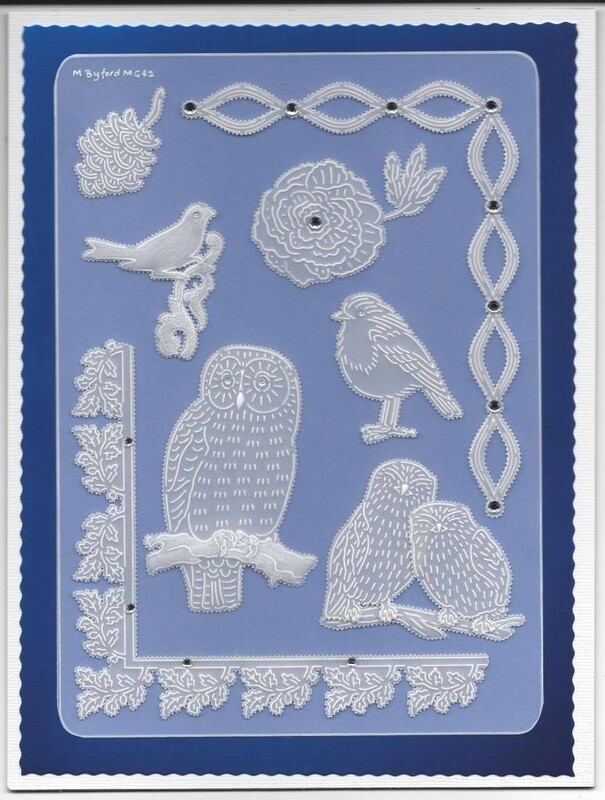 Multi grid no 20 has plenty of oval frames and corner designs, simply create your own edges and lace work by using the perforating and /or embossing patterns on the multi grid. This grid can be used in combination with Pergamano perforating and embossing tools as they fit the grid exactly. 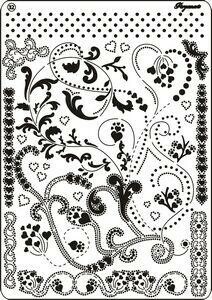 Multi grid no 19 has a diagonal grid, simply create your own edges and lace work by using the diagonal grid. This grid can be used in combination with Pergamano perforating and embossing tools as they fit the grid exactly. 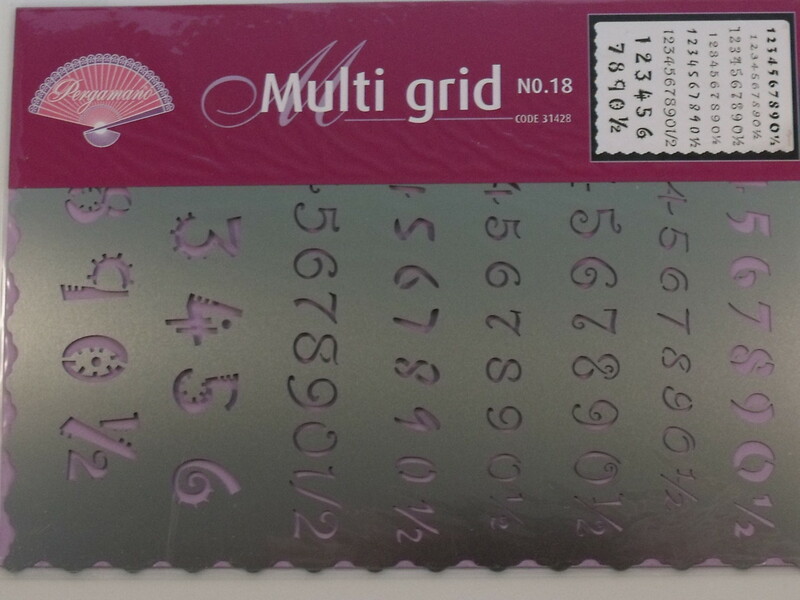 Multi grid no 18 has numbers in different fonts and an edging, simply create your own edges and lace work by using the perforating and / or embossing patterns on the multi grid. This grid can be used in combination with Pergamano perforating and embossing tools as they fit the grid exactly. 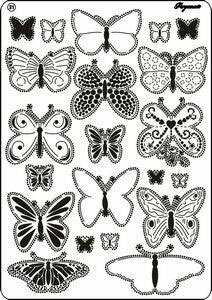 Multi grid no 17 has butterflies and butterfly borders, simply create your own edges and lace work by using the perforating and / or embossing patterns on the multi grid. This grid can be used in combination with Pergamano perforating and embossing tools as they fit the grid exactly. Multi grid no 15 is themed around love and will offer you plenty of opportunities to fill up borders and blank spaces with a perforation and/or embossing pattern. 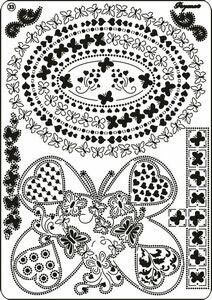 Among others, this grid contains lucky clovers, a bow, a bear, a key and a number of general motifs with alove theme, simply create your own edges and lace work by using the perforating and / or embossing patterns on the multi grid. This grid can be used in combination with Pergamano perforating and embossing tools as they fit the grid exactly. 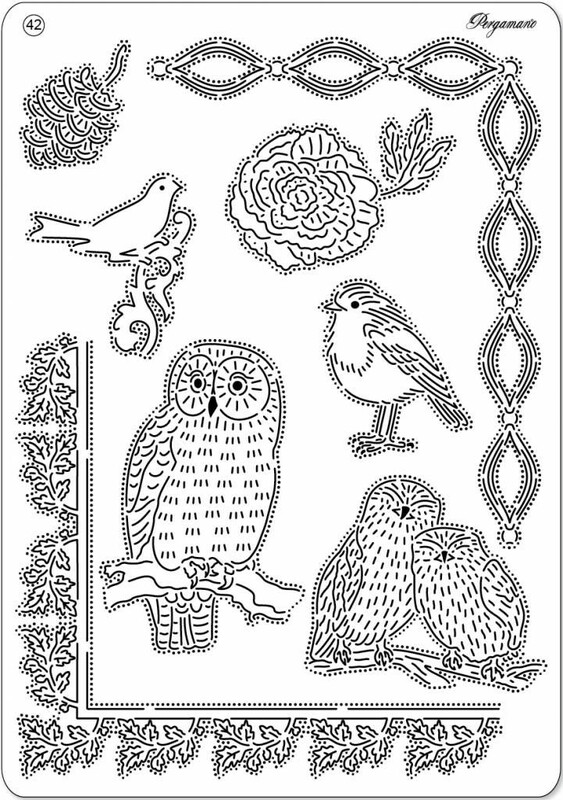 Multi grid no 14 has ladybirds, flowers and a swan. 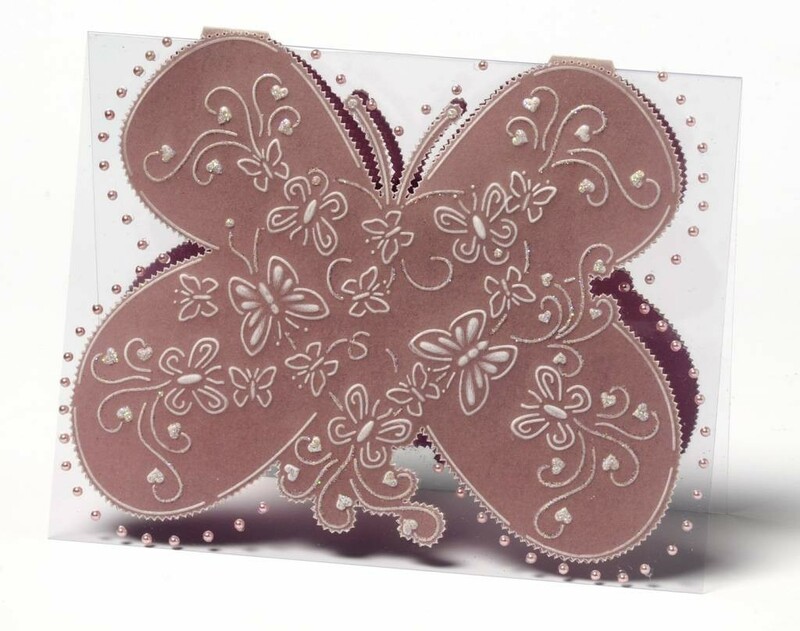 Simply create your own edges and lace work by using the perforating and / or embossing patterns on the multi grid. This grid can be used in combination with Pergamano perforating and embossing tools as they fit the grid exactly. 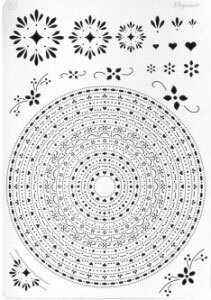 Multi grid no 13 has plenty of circle frames and motifs, simply create your own edges and lace work by using the perforating and / or embossing patterns on the multi grid. This grid can be used in combination with Pergamano perforating and embossing tools as they fit the grid exactly. 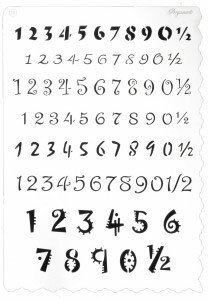 Multi grid no 11, simply create your own edges and lace work by using the perforating and /or embossing patterns on the multi grid. This grid can be used in combination with Pergamano perforating and embossing tools as they fit the grid exactly. 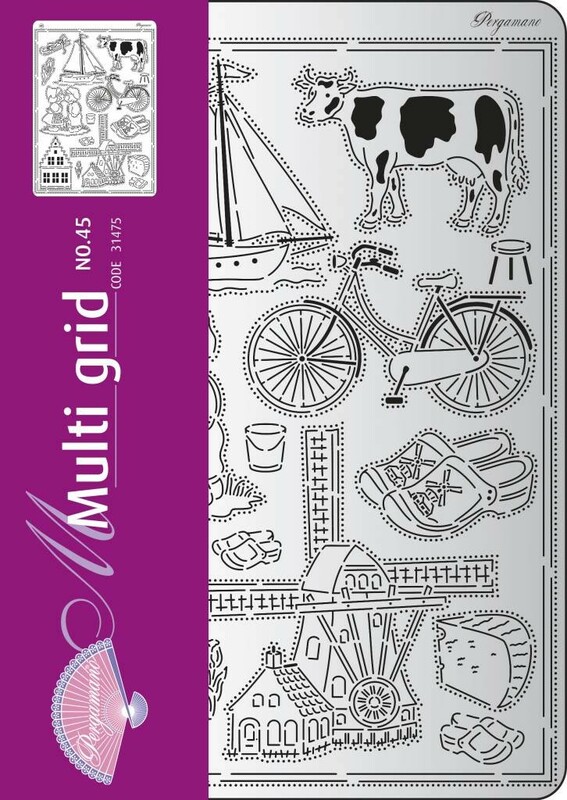 Multi grid no 08, simply create your own edges and lace work by using the perforating and / or embossing patterns on the multi grid. This grid can be used in combination with Pergamano perforating and embossing tools as they fit the grid exactly. 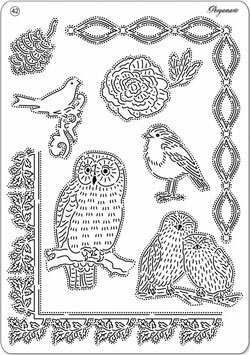 Have a look at the sampler worked by Maggie Byford to see how you can use this grid. 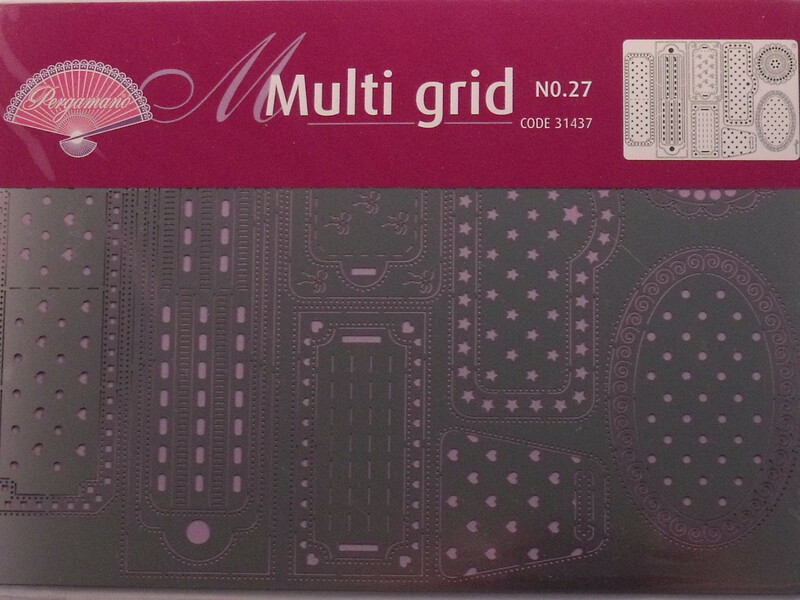 Multi grid no 06, simply create your own edges and lace work by using the perforating and / or embossing patterns on the multi grid. This grid can be used in combination with Pergamano perforating and embossing tools as they fit the grid exactly. 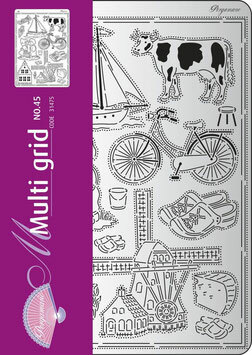 Multi grid no 05, simply create your own edges and lace work by using the perforating and / or embossing patterns on the multi grid. This grid can be used in combination with Pergamano perforating and embossing tools as they fit the grid exactly. 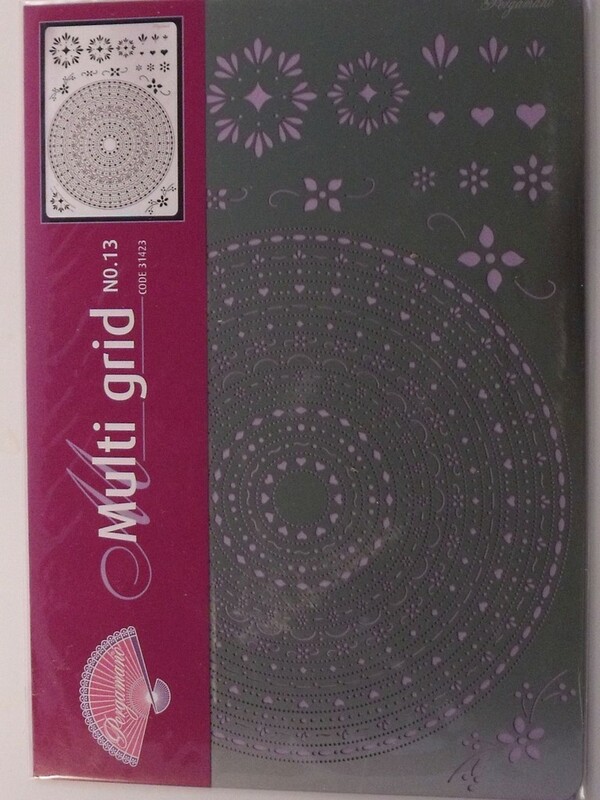 Multi grid no 04 straight grid, simply create your own edges and lace work by using the perforating and / or embossing patterns on the multi grid. This grid can be used in combination with Pergamano perforating and embossing tools as they fit the grid exactly.